Scandi-aqualine a/s closed at the beginning of 2010. This unfortunately was the end of Scandispa production in Denmark... but not the end of the story. 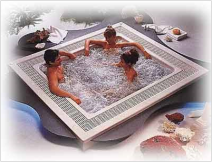 Today the Scandispa brand of whirlpools and spas is manufactured at Scansani Sp.z.o.o in Poland. The Scandi-aqualine a/s designs still exist, and the factory in Poland produces them and a wide range of other models. Scandi Parts ApS represents Scansani Sp.z.o.o. Do you want to know more? Call us for details.